While the Melody does not offer the cutting edge technology, top performance and features of the Athena or Delphi, it is the proven choice in the entry-level category. The Melody incorporates the revolutionary Biostone Filtration System. The BioStone Filtration System is simply the finest filter you will find in any ionizer available today. If you use well or untreated water please have your water tested first. With the exception of the newest patented Mesh Diode Electrode found in the Athena and Delphi, the electrodes in the Melody shine in comparison to anything else on the market. You can rest assured knowing your Melody is tried and true - one of the world's best selling ionizers over the last four years! The Melody employs five platinum/titanium electrodes. Each titanium elctrode is coated with pure platinum using advanced electroplating techniques - ensuring top performance and reliability. Mineral deposits build up on the electrodes over time decreasing performance. All ionizers employ some form of cleaning cycle to help minimize this. The Melody does not have the superior cleaning of the new patented DARC cleaning system found in the Athena and Delphi, but it is still a cut above other brands on the market. The Melody/Isis employs an automatic post-use self cleaning mechanism - meaning it cleans automatically after each and every use. 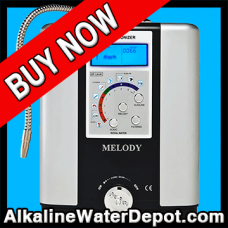 We realize it is inconvenient to not be able to use your water ionizer while in it's clean cycle. Our new patented reversible chamber allows for an automatic water flow regulation so that you can always enjoy alkaline water even while your ionizer is cleaning. You will want your ionizer company to be around to take care of your needs many years after you make your purchase. Emco Tech's experience in ionization since 1982 allows you to buy with absolute certainty. It is peace of mind to know your company will be around to support you - unlike unproven new start-up companies which often leave customers high and dry. 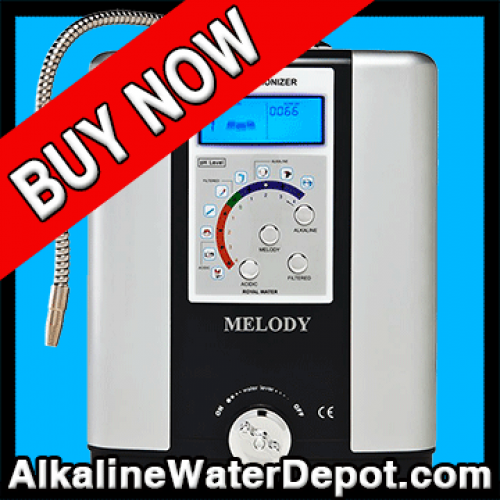 The Melody offers a flow control knob providing you better control of the water pressure and pH settings. The flow control also provides for the possibility of alternate installation options. Unlike most other models which can only be installed one way, the Melody/Isis can be installed at your sink with a diverter from the tap, or plumbed directly to your cold water line. This allows you to add extra calcium to your ionizer. Some areas however have "soft water" or water that is low in naturally occurring calcium and other dissolved minerals. This feature is intended to boost ionization performance in soft water areas when necessary. The Microm System is a microcomputer that controls all functions and maintains suitable water pH according to the volume of water flow. It features self-diagnosis and a one-touch system for all functions. If there is an electrical overload due to water quality or industrial pollutants such as mercury, the Micom System disables ionization. The Melody has a glass tube fuse that will protect the expensive circuitry in case of power fluctuations or surge. Flow rate indicator - This indicates the rate of water flow through your Melody. Low Pressure Alarm - protecting against low water pressure. Hot Water Alarm - will illuminate and turn the unit off in case of hot water is run through it. Alkaline and Acidic level indicators - numerically display the level of ionization selected. Filter Life Indicator - counts actual filter use. It is not a timer like on less expensive models. Comes with everything you will need to perform a standard installation including a DVD and manual. Unique or custom installations may require extra parts and or adapters. Contains test tubes, reagent liquid and a pH color chart to help you understand the ionizer's performance so that you can be sure you are drinking the right level of pH.